At the day’s early beginning, the rooster crowed. I was visiting Julian Woods Community near State College, PA for School of Living’s quarterly meeting. I went outside and through the outdoor kitchen that blends into the magical natural setting of Deb Fisher’s homestead. I watched and listened as Deb and her daughter saw to the comforts of their mellowing guardian dog. I saw mother hens escorting their chicks to forage. It was a very sweet space in a gentle moment. Deb told me that the hens raise their own chicks as it suits them. With the rooster, they do a great job of sustaining a healthy flock that provides eggs, meat, fertilizer, pest control, and entertainment while living a splendid chicken life. We walked to the greenhouses, important components of School of Living’s “Living Machine” which takes care of the community’s wastewater. This is, also, the primary site where Deb grows gorgeous flowers for her successful flower business, Deb’s Flower Farm. She sells her own, organically grown; plants, flowers, and flower arrangements at the local farmers market. She, also, does arrangements for special events and commissions. Deb is one of the many members of School of Living who is living, studying, and sharing the principles and practices which are directed toward creating a resilient, local, self-sufficient and sustainable community. 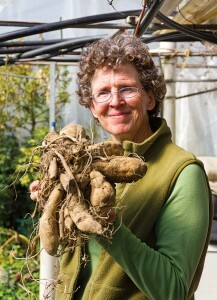 I discovered that the State College Magazine published “In Full Bloom Growing the Natural Life” about Deb with a focus on her unique flower business. Photo by Matt Fern for In Full Bloom Growing the Natural Life in State College Magazine, June 2015 issue. As I looked online for the story to share, I discovered another article in The Centre Daily Times about Deb’s ability to create functional and sculptural objects with hypertufa material. At her home, I saw wonderful examples of containers for plants and sculptural artwork that Deb formed from hypertufa. They have a way of settling into their natural environments beautifully. I am inspired by this woman. Being in her presence strengthened my wish to live in a way that promotes a strong community and builds self-reliance while sharing clear expressions of beauty, creativity, and love. Thank you, Deb!